Potter Heigham is in the heart of the Norfolk Broads, and one of the busiest roads runs through the middle of it, but St Nicholas is set away from all the tourist madness on the edge of the village overlooking the fields. It is plainly one of the most attractive churches in the county, with wide, neatly thatched roofs topping off the nave with its tall clerestory and the more rustic chancel huddled at the east end. The bell stage to the round tower is later than most, and is elegantly decorated with flushwork and crowned with battlements. The overwhelming effect is of the late Middle Ages.Brick was used to good effect to pick out the clerestory windows and the niches on the otherwise rather stark porch. In the central niche is the figure of a woodwose, probably from the tower parapet of another church. 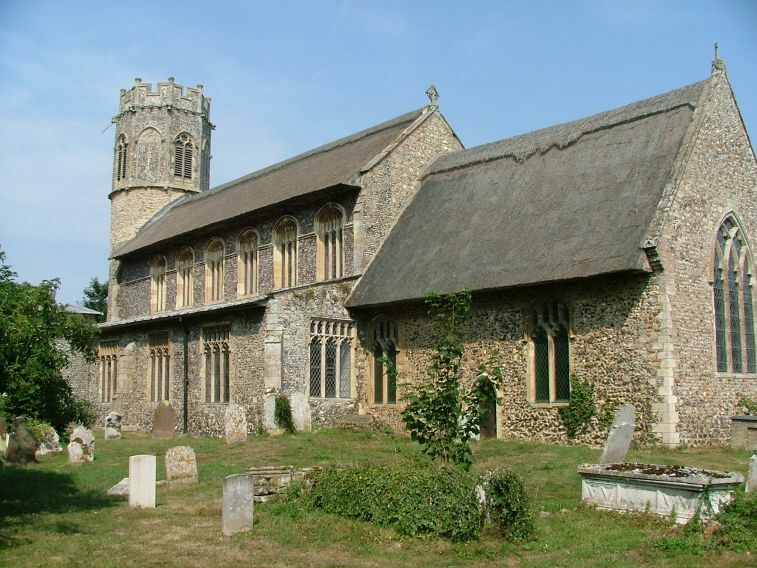 Simon Jenkins famously said that the parish churches of England are its folk museum, and St Nicholas feels rather more like a museum than most, not least because it is one of the few churches in this part of the Broads which is kept locked. There are three keyholders listed, but on two occasions I have found all three of them out. St Nicholas may not be immediately available for private prayer and reflection as other churches are, but if it is a museum then it is a good one, full of fascinating details. The most striking on entry is Norfolk's only brick font (Suffolk has another at Polstead). It appears to be 15th century; there are banded details which have eroded, but may have been trefoils. Curiously, the very name Potter Heigham suggested that this was a place where clay for bricks was to be found. But it is for its wall paintings that Potter Heigham is justly famous. The best are the Seven Works of Mercy in the south aisle. A woman in a shawl is shown in the seven scenes depicting Christ's injunctions. In the best of them, she comforts a dying man, while in another she offers a loaf of bread to an old man who is hungry. In a third, she opens her door to give shelter to a homeless stranger who is dressed in the garb of a pilgrim, a message to locked churches if ever there was one. The paintings in the south aisle must have been a sequence of the life of Christ, and the best surviving images are of the Annunciation and the Adoration of the Shepherds. A tall standing figure is probably St Christopher, but I can't help thinking that he looks a lot like medieval images of St James. High above the chancel arch you can still see the outlines of the group of figures of the Blessed Virgin and St John which flanked the rood. The cross there now is modern, but below there are surviving figures on the dado of the 15th century roodscreen. The gates are now missing, and as often in Norfolk as the Reformation approached, the figures of the four Evangelists (St Mark holds a delightful pet lion) and the four Latin Doctors (St Jerome spendid in his cardinal's hat) have pride of place. But also here is a rare survival, St Eligius, the patron Saint of farriers. He holds a hammer and a staff. Above all this, the hammer beam roof is a lovely crowning, intimate in scale in what is not, after all, a huge church. A brass plaque in a chancel window is a simple reminder of Queen Victoria's Diamond Jubilee. The Twentieth Century has added its details: a wooden screen dated 1947 is a war memorial, and there is a gorgeous roundel of St Nicholas in a window of the south aisle. The White family contributed seventeen corpses to the chancel floor in the late 17th century. A single ledger stone remembers them, and recalls that they were Lovers of the Church, Loyal to their Prince, True to their words, Just in their dealings, Kind to their Neighbours and Charitable to the Poor, a no-less important catechism in those days of Puritan schism than the Seven Works of Mercy had been during this building's Catholic days. Poking around at the back of the church, I found, lying face down, a notice which had formerly been on the outside door. It read Brother, this Church doth open stand for thee, that thou may'st enter, sit, rest and pray. Remember whence thou art and what shall be thy end, remember us, and go thy way. A pleasing Victorian sentiment, and a thought-provoking one, although the suggestion it makes is, of course, no longer possible.